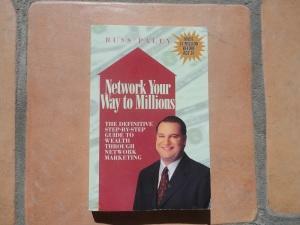 Today, I want to do a book review for the book “Network Your Way to Millions” by Russ Paley. Russ is a top earner in Melaleuca. I received this book in the mail when I did a book swap with a good friend of mine. I had heard of Russ before, since I did a brief stint in Melaleuca, but I never knew he had a book about network marketing. I really enjoyed the book. I thought it was well organized, well written, and easy to follow. The content was great. The book was published in 1999 by Wealth Building Publications, Inc. It is in softcover format and has 224 pages. Overall, I give the book a 7 of 10. What I want to do in the paragraphs below is share forty of my favorite quotes from the book. Each quote is in bold and italics. After each quote, I will share my own thoughts on the subject. Enjoy! # 1 Most networking companies will not make it. The truth is, most businesses fail. Whether it is a traditional business, online business, or network marketing company there is usually a high failure rate. # 2 You should look for a networking company that’s over five years old. Ideally, you want to work with an established company that has worked out the kinks, has good finances and a proven track record. You want to work with a company that will be around for the long haul. Learn how to find the right company. # 3 Repeat orders for the same product or service is what makes income residual. At the end of the day, you make money in network marketing by creating volume. To do that, people have to use and/or sell the products. Without a good product at a fair price, it will be very difficult to get repeat orders. # 4 It is very advantageous for you if the company offers thirty or more products. You want a company with a diverse product line. It doesn’t have to have hundreds of products, but 30 to 50 is a good starting point. You need a variety of products to appeal to more people and get more orders. If your company only has one product you really limit yourself. # 5 Service-only companies are risky ventures. The service industry is ultra-competitive. What might be hot today might not be around tomorrow. That’s one of the reasons I prefer product based companies. # 6 You want a company that is product centered! A company must have good products at a fair price. If it’s not a good deal for the customer, your customers won’t stick around. If everyone is only talking about the business opportunity, and not the products, get ready to eat a big lunch! # 7 The products are the backbone of the company, not the compensation plan. The compensation plan grows from the products, not the other way around. Without good products your compensation plan won’t matter much anyway. # 8 Look for a company with a high reorder rate. Most networking companies have a reorder rate of between ten and thirty percent. If people aren’t reordering month and after month, you are really missing out. That’s why finding a company with good products is so important. # 9 Replacing inactive customers is very de-motivating. This is a big reason why networkers give up. If every customer and distributor you bring into the business quits, it’s hard to stay motivated and keep pressing forward. # 10 I would rather make a percentage on a person’s monthly purchases for the rest of his or her life than receive a one-time, up front big bonus on a customer’s initial order. The real money and real profits in business is made in repeat orders, not the first purchase. # 11 The breakaway marketing system gives the advantage to leaders who break away. If they break away from you, you lose the residual income they produce. Some of the older compensation plans can really limit your income if one of your downline members reaches the top levels in the company. # 12 You cannot drag anyone across the line in this business. You can’t motivate people. Motivation comes from within. Work with the willing. Learn how to motivate your team. # 13 Never beg; always work with the people who are already motivated! This goes hand in hand with the previous quote. Work with the people who are taking action and doing the work. # 14 Goals that are not written down will not be achieved. If you want to achieve something, put it down on paper and give it a deadline. A dream is something in your mind. A goal is written down. # 15 Never forget that prospecting is a numbers game. Sales is a numbers game. Work the numbers and everything will fall into place. # 16 Rejection is one of the biggest reasons why people stop working the business. Most people can’t handle continuous rejection. Selling is not for the weak. # 17 One of the keys to fast success for you and your organization is to recruit up. Try and sponsor people who are already successful, have a good sphere of influence, some disposable income and a good self image. Learn more about your best prospects. # 18 If your investment in any form of marketing is consistently greater than your profits, stop using that part of your marketing repertoire. Whenever you spend any type of money on advertising and marketing, make sure it produces a good ROI, or drop it! # 19 Never forget that bad word of mouth spreads faster than good! Treat people well and they will tell a few people. Treat people bad and they will tell everyone. # 20 If you don’t know what you’re doing, Internet marketing can be a vastly unproductive money-drain. The internet is not the answer to all of your troubles. It’s actually harder to build your business online than it is offline. # 21 One good prospect could ignite your entire business. You can find customers anywhere. It’s true, one superstar can propel your business to the next level. Most top earners make most of their income from one to three people on their team. # 22 Two-on-ones, if at all possible, should be done at the prospect’s home or office. If you invite one guest to your home, the chance of a no-show or cancellation is much higher than if you go to the prospect’s house. Whenever you meet with a prospect, go to them. # 23 The majority of my success has been through two-on-one presentations. Leverage your upline or sponsor to help you get some people sponsored. Learn more about the two on one. # 24 If I never make another nickel in this business, I still would be using the products and services every month, because of their low cost, high quality and convenience. Find a company with products you are really passionate about. # 25 Teach your business builders how to do the phone invitation and learn the art of overcoming objections. Learning how to master the phone is one of the most important things you can do. The phone is your friend. # 26 I run with the runners. I walk with the walkers. Match people’s efforts. Never do more for someone than they are willing to do for themselves. Learn more about who to work with. # 27 The people I’m really looking for are those who have a burning desire to be more successful than they are today. Look for people who are sick and tired of being sick and tired with their present circumstances in life. # 28 I spend more time working on myself than I do on other people. Focus on your own personal development. If you want your life to get better you have to get better. # 29 I am tenacious. I walk and talk my business. Keep your business a top priority in everything that you do. # 30 I believe people have to actually schedule for themselves whatever time they’ve decided to commit to the business – but they have to schedule it! Make your business a priority by scheduling your time to work the business. Write it down in your day planner. # 31 The only way you can become a leader in any business is to take responsibility for setting an example. Take 100% responsibility for your own business. Man up! Woman up! It’s no one else’s job to make you successful. # 32 Leaders aren’t appointed. They make themselves leaders! To become a leader you just have to make the decision to be a leader. # 33 The only difference between the top money makers and the average earners in any program is that the top people have done more presentations. It’s true, top earners have just gotten more NOs that you have it. That’s it! # 34 Successful leaders realize that the pace they set is the example for the rest of the organization. The speed of the leader is the speed of the team. # 35 Customers do not grow our business, business builders do. While customers appreciate your products, business builders are looking for a check. If you want to attract other leaders, it’s imperative that you create a respectable check for yourself as soon as possible. Become successful. Work on yourself. Be a leader. Do that and you will attract the right people into your business. # 36 Eighty to ninety percent of everyone coming into the business will be only a customer and will not build the business. Most of your team will just be product users, even if they initially signed up to be a distributor. # 37 All great leaders in our industry sign up a minimum of four new customers a month. Sponsor one new person a week, every week, and never stop. New distributors are the lifeblood of your business. # 38 All great leaders help one of the people they’ve signed up to advance to the first leadership level during each thirty to ninety-day period. When you sponsor someone new, do what you can to help them achieve success right out of the gate. # 39 Great leaders are always positive, honest, and helpful to everyone growing the business. Stay positive. Do the right thing. Treat others well. Be accessible. Return calls and emails promptly. # 40 Great leaders have specific goals which they revise often. Set goals. Write them down. Review them daily. Update or change them when needed. Russ was the first Corporate Director with Melaleuca. He has a team of more than 12,000 customers and he’s been with the company for more than 20 years now. In summary, “Network Your Way to Millions” by Russ Paley is a great book. I highly suggest you order a copy, read it, and add it to your leader’s library. Overall, I give it a 7 of 10 and consider it a must read for any new or experienced network marketer. What are your thoughts? What is your favorite quote on this page? Did you like the book? What was your greatest takeaway from it? Leave a comment below to share your thoughts. I look forward to hearing from you. Previous Previous post: MLM Depression: MLM Got You Down? We drove past the Puerto Rico Melaleuca office today and it reminded me of this post. I was reading it again and noticed how Russ stated it is best to work with a company that has at least 50 products. I am in agreement with this because it provides you many sales avenues. Just because a customer doesn’t care for, or want one item doesn’t mean they won’t want something else. I came back to this post for some inspiration and I was really drawn to quote #40 about great leaders having specific goals which they often revise. This is so incredibly poignant. As things within the industry change and things within your specific business change, your goals should as well. I am constantly updating my business plan and my goals so that I can reach higher heights and achieve new accomplishments. I am never satisfied with the status quo. Once one goal is met I am on to another and I love that. Great quote there. As I reread this post, I am grabbed by more of the quotes by Russ. He has a lot of wisdom in the quotes he had. Looking for a company that is over 5 years old is quite wise. I would only say to go against that if a company seems to have superior products or services. #18 is also a no-brainer, but many people don’t heed it. This is why you should keep statistics. If you are losing money on any form or technique, it is best to get rid of it and try something different. Insanity is defined as doing the same thing over and over thinking there will be different results. #26 is also timely. To really get sales and business, we must be, and act as the person we are pitching. I agree that working with an established company makes the most sense. First off, I love Melaleuca. It is a great company with high quality products. My father was a distributor for the company for many years and he thrived, so the fact that Russ found success with the company is appealing to me. I like the specific quotes you pulled out from the book, and I am very interested in finding out what else Russ has to share within his book. I foresee a trip to amazon.com in my near future. This is a very good list of quotes. I do feel a big desire to read this book. I have used Melaleuca products, and they are a good product and their prices seem quite fair. Some of the quotes that hit me the strongest were: #6 product centered versus service centered makes a lot of sense. #39 A positive mental attitude makes the best sense. Great post Chuck. Thank you. I’ve also used the Melaleuca products myself and they are wonderful.